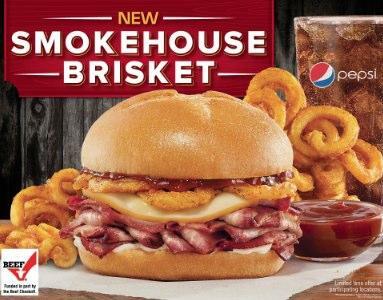 Have you tried the NEW Arby’s Smokehouse Brisket Sandwich? The brisket is slow smoked with hickory wood for at least 13 hours to get the perfect amount of smoke flavor and tenderness leaving the meat super moist. The brisket is piled high on a toasted bakery-style bun. Topped off with smoked Gouda cheese, BBQ sauce, mayonnaise and my personal favorite touch… crispy onions! DROOL. Now that you know your closest location, why don’t you see what all the talk is about and try a new Smokehouse Brisket sandwich for yourself! What is it about this new sandwich your excited to try? Is it the toasted bakery-style bun, smoked Gouda cheese, BBQ sauce, the piled high hickory smoked brisket? Or are you like me and can’t wait to get a bite of those crispy onions? 1 Comment at Have you tried the NEW Arby’s Smokehouse Brisket Sandwich? I am a lover of all things BBQ and I can’t wait to try this sandwich.